Klewel 2.0 | How to disrupt a 150-Year-Old Swiss Company in a Digital World? 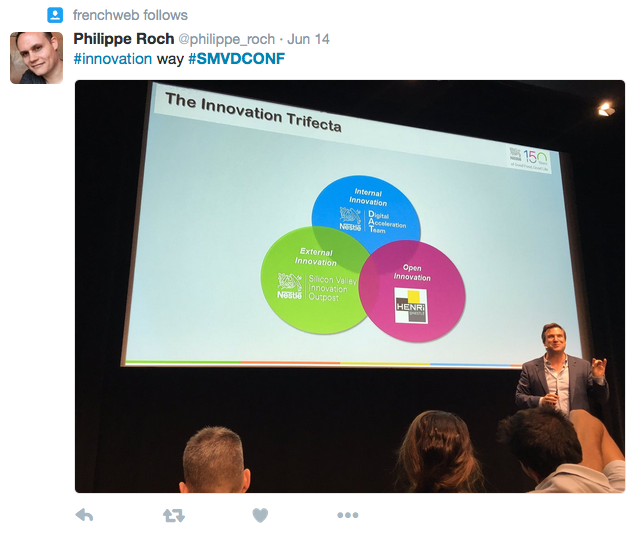 How to disrupt a 150-Year-Old Swiss Company in a Digital World? Companies like Leclanché and Nestlé have both reached 100+ years. They focus on very different markets (Leclanché in the Energy sector while Nestlé in the Food&Beverage sector and recently wellness) and are very different. However both are talking about Transformation. Leclanché in a “very very fast growing market” where Tesla plays an important role. More about Leclanché here. 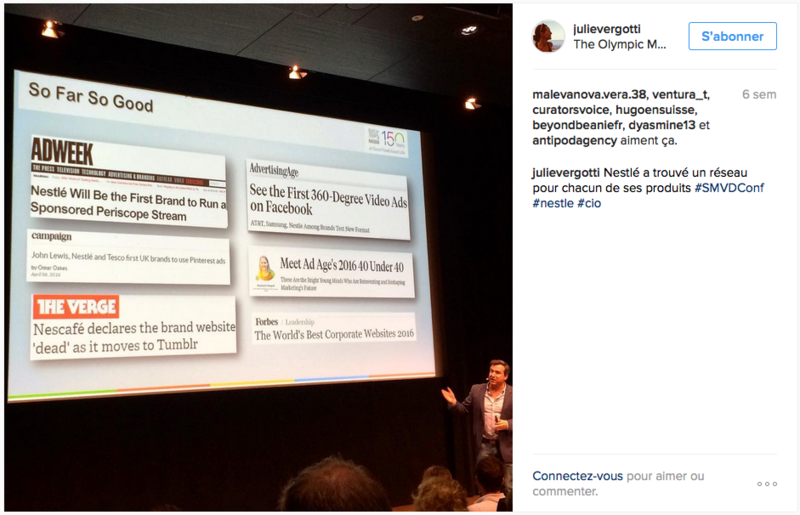 And Nestlé in the digital space. 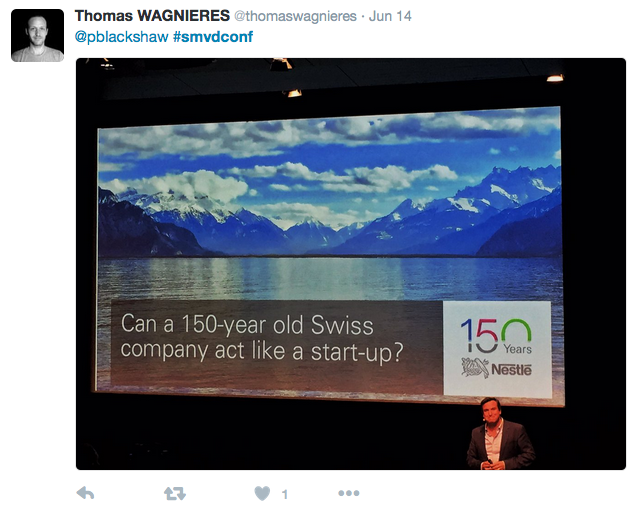 What about Nestlé’s case: Can a 150-year-old Swiss company act like a start-up? Part of the answer was the creation of a highly entrepreneurial Digital Acceleration Team (DAT) ( jump directly to slide 33 of his talk), comprised of 12-18 leaders from diverse Nestlé markets who work at the global headquarters for 8-month terms. Housed in a start-up oriented Consumer Engagement Center right above the Nestlé Executive Board, the team members embrace an innovation culture of “Listening, Engaging, and Transforming”. Since it first launched in 2012 the DAT program has graduated over 90 leaders, facilitated 100 “hackathons” across key business needs, reverse mentored 75 Senior Executives. At slide 33, Pete Blackshaw is talking about Bringing startup value internally. Another part of the answer is the Silicon Valley Innovation Outpost (SVIO), with a mission to create a more effective and rapid “outside in” approach to innovation. 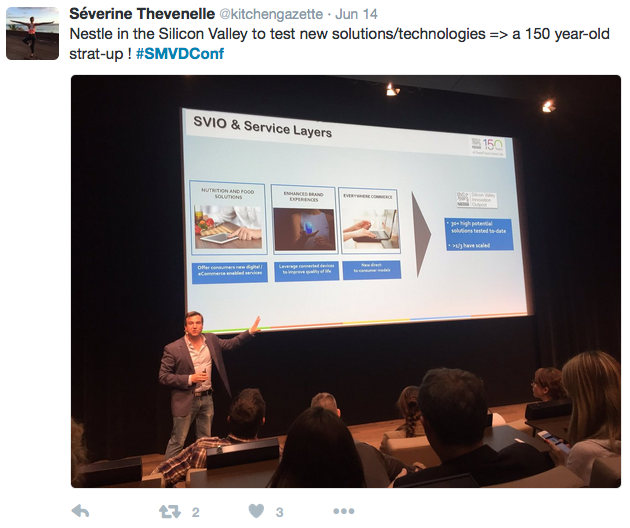 The SVIO works with leading technology partners and especially promising early stage entrepreneurs. Jump directly to slide 41 of his talk about SVIO. Can a 150-year-old company act like a startup? Pete thinks so. Webcast: Jump to Slide 6: Today, we are no more talking about work/life balance, but about work/life advantage. It is about managing tension as a success criteria for leadership. 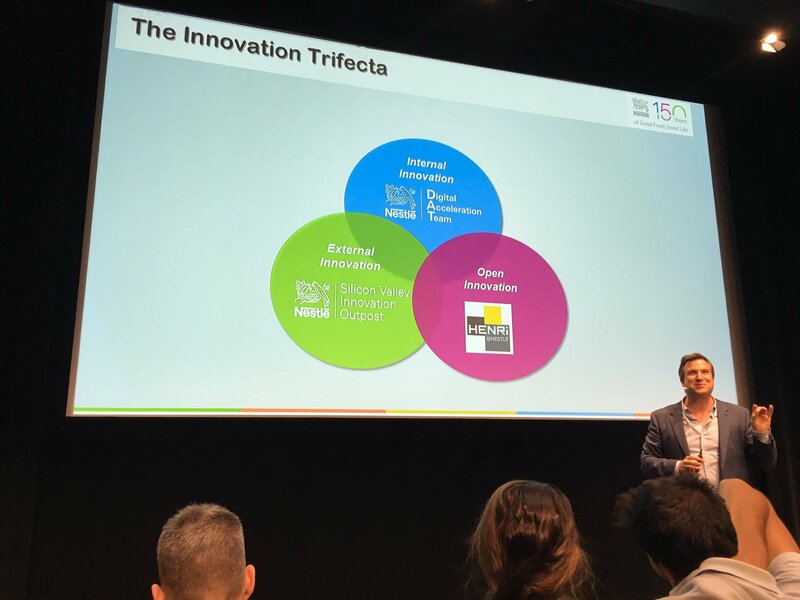 Trifecta: internal/external innovation, and open innovation. In the digital space, so much of what we do in our personal lives has unique value for what we’re doing on the professional front. 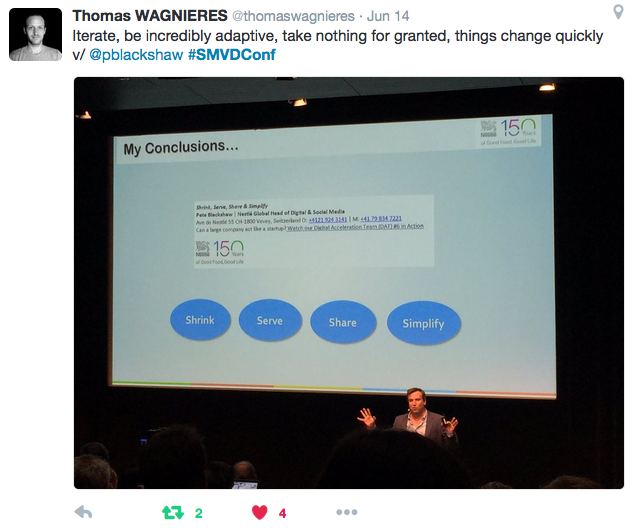 Pete Blackshaw is an active content creator. Snapchat, YouTube, facebook… Learning valuable lessons for business while using these tools personally. Jump to Slide 8: “Trust your inner consumer.” Remedy for too many numbers thrown at you. Learned: a photo with a swiss icon on it, 100 likes, add a kid, add 100 likes, add a dog… You learn a lot by testing stuff in your personal life. Jump to the webcast, directly at this Slide 9: First real business and online awakening: While he was undergrad at University of California Santa Cruz, he designed logo, was super popular and that helped him travel to Europe etc. Then he got a call that a director wanted to use the T-shirt in a film. Tarantino! Travolta! Suddenly swamped by media queries (1st-year business student wondering if he was going to flunk). He created a website: slugweb.com “World Famous Slugwear” — right around when Mosaic came out. 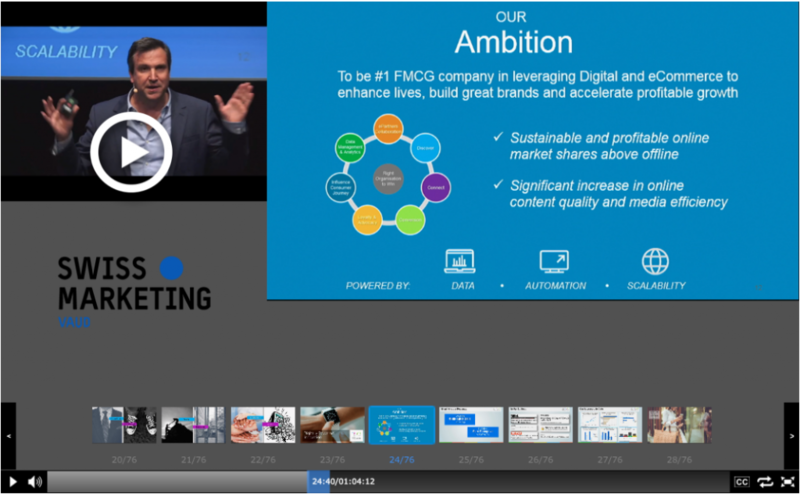 Jump to the webcast, directly at this Slide 11: Other big epiphany: at P&G (jump to the webcast at 8’50s “never be afraid to write the memo”), understood the internet is fundamentally about feedback loops. Feedback is currency for relationship marketing. There are very predictable talk drivers that get people to talk positively or negatively about companies. Fast food: biggest negative talk driver = hygiene. Retail: training of employees. Wireless: money. 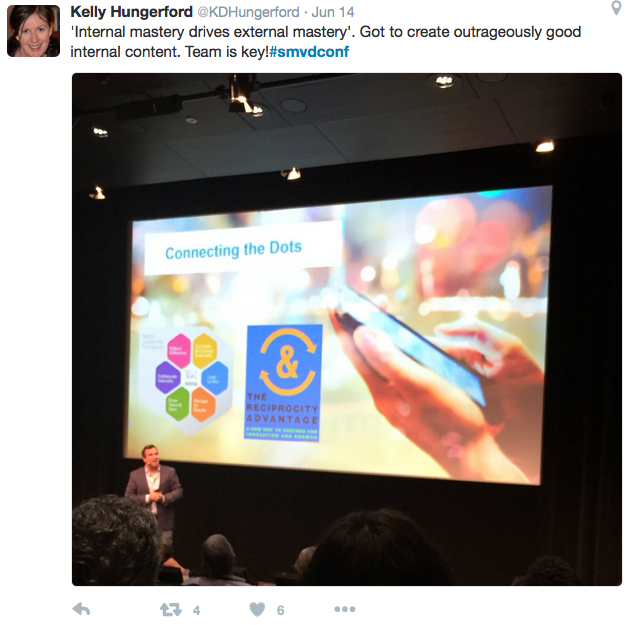 He has a passion around social media, feedback loops, talk drivers. What makes people talk positively or negatively about Nestle? The internet is a world of debits and credits. The most important thing is nurturing brand credibility, managing tension. Digital discussions often get way too technical. Tensions in the digital space: Digital Dualisms (his advice: “google them”). Jump to the webcast at slide 17: Big one: integration vs. stimulation (standalone or integrated with everything?) Answer: yes and yes, all depends on context. 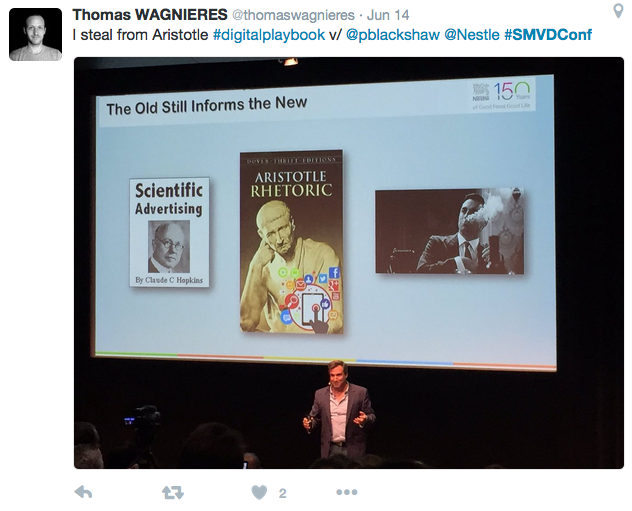 Example: Nestle’s “Brand Building the Nestle Way” (pre-digital truths/principals) => has been able to move reasonably fast in Nestle by referencing these principles. 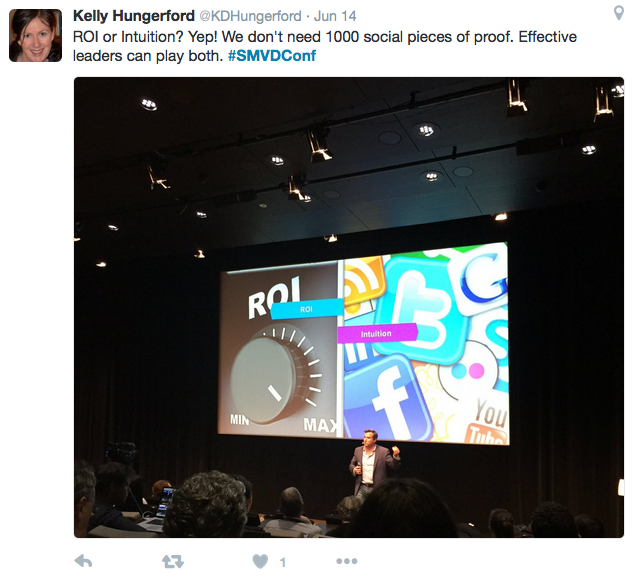 Ultimately everything is going to be digital (go for the CMO jobs, not the digital jobs). Another good one: ROI vs. intuition. We need data to justify big investments but we can leverage intuition in the digital space (cf. work-life advantage => leaps of faith). Good leaders understand that tension and balance it, know when to use numbers and when to use intuition. Another: Formal vs. informal power. Large companies can be very hierarchical, rules of admission, protocols. 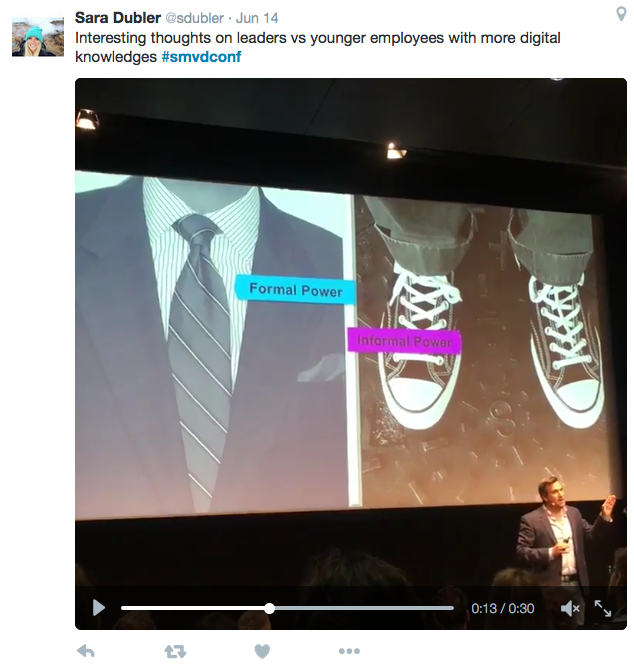 Digital space empowering “lower levels” in the company. Challenge for the organisation but also opportunity! Try and play both sides. The digital space has really opened up the informal power area. Enabler vs Gatekeeper (Jump to webcast at slide 21): as leaders we have to drive compliance, enforce privacy, etc. Non-negotiables. But if you’re trying to make an organisation more like a startup, you have to be an enabler. To get ahead in the digital space you need to test like crazy, but also need to know when to stop. OK, Nestle now. Focus on the innovation side. What are we trying to accomplish. 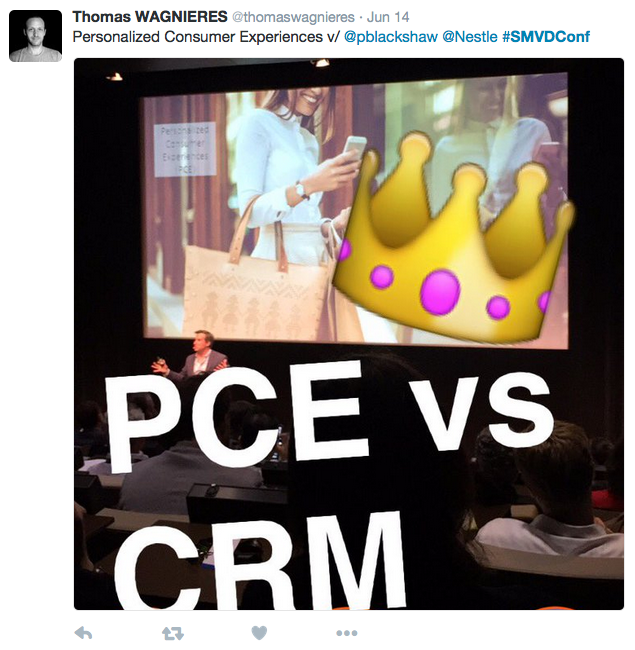 Declare ambition to lead, even if it seems unattainable initially.
. Pete Blackshaw doesn’t like the term CRM (yesterday’s legacy). Trying to build smart discipline in this area. Earned media as much as paid media. Massive opportunity to find more buyers via digital channels. More spend per buyer, too, but most of all, more media per buyer. That will lower the cost of marketing, because earned media is much more effective. Worked great! Was an experiment, didn’t know where it would go. We generally underestimate the power of organisational virality. Have now reverse-mentored over 100 executives. The environment is also moving fast! Have a Silicon Valley innovation outpost (not the only ones to do this). Swiss employee heading to the US, lots of relationships with startups, VCs, innovators over there. Trying to be close to innovation hubs. Nutrition and food solutions, enhanced brand experiences, everywhere commerce. A lot will fail but that doesn’t matter. 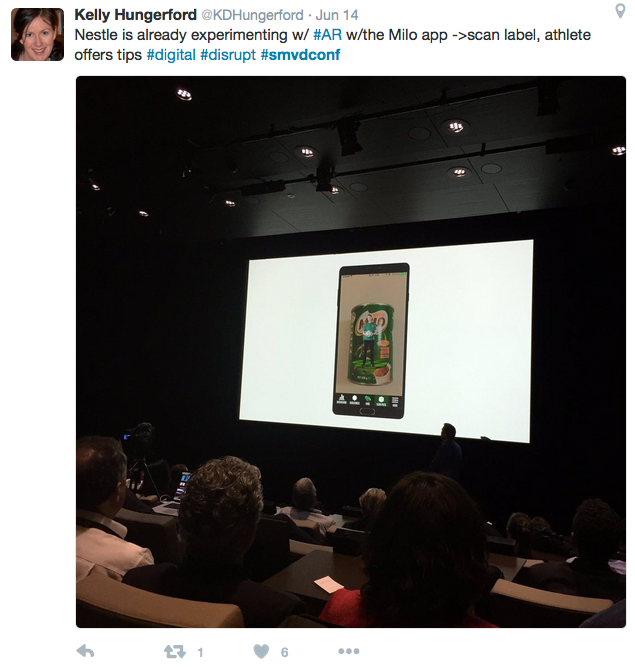 Example: app MyGerber/OVIA; Milo’s Bold “Service” Layer — tracker. This partly answer the question “How do you add value on top of the physical layer?”. 3) July, normally, will unveil an open innovation platform (Henri). Pressure on Nestle too to meet expectations of small companies which might take part! Platform with projects, timeline, profiles… very entrepreneurial-friendly. Will see what clicks and what doesn’t with the community. Creating a digital context for businesses, entrepreneurs, etc, to have access. Not just physical space like in Silicon Valley. Connecting the dots: the reciprocity advantage. People’s incentive to share is they know they’ll get advantages out of it. 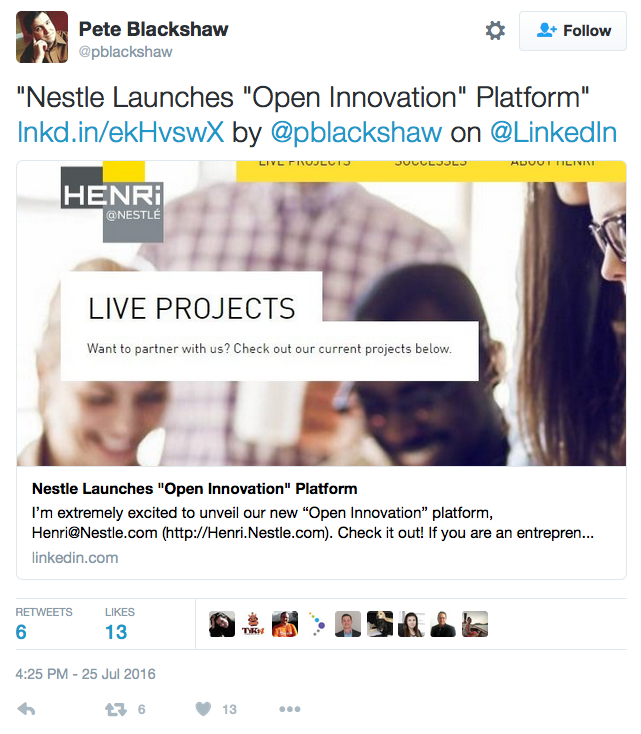 Nestle is a decentralised network, challenge and advantage. Leadership framework, works with digital. Internal social network (chatter). Internal mastery drives external mastery. If you can get to your employees (attention span of a flea, stressed out, super tough audience!) then you’re ready. Pete posts a lot of content in there. You learn a lot! Hires people who share. Everyone in the team has to post updates before the weekly meeting. Getting “social” inside the company! It’s not about flipping on a switch. You need to be a strong leader. Steph-note: like I say, throwing social tools at people won’t make them use them. Other example. Trying to get websites more mobile-friendly. Sending memos has limits. So the DAT team created a show called “Mobile or Not” and stuck it on the intranet. 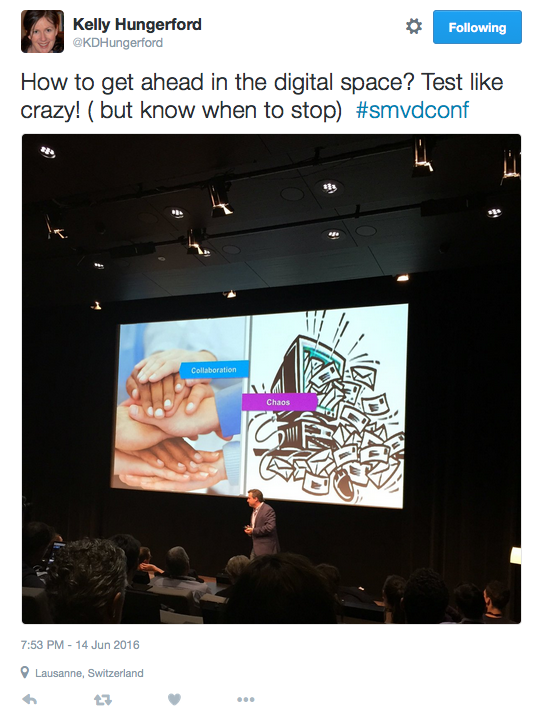 steph-note: I understood “Mobile or Die”, better, no? Social media is a huge motivator, so use it inside too! Mobile score card online. CMO’s calling Pete begging him not to feature them in Mobile or Not. Keep things really simple. The old still informs the new (Read Aristotle’s Rethoric! Scientific Advertising by Claude C. Hopkins) — get people to see they already know this new stuff we’re bringing to them. 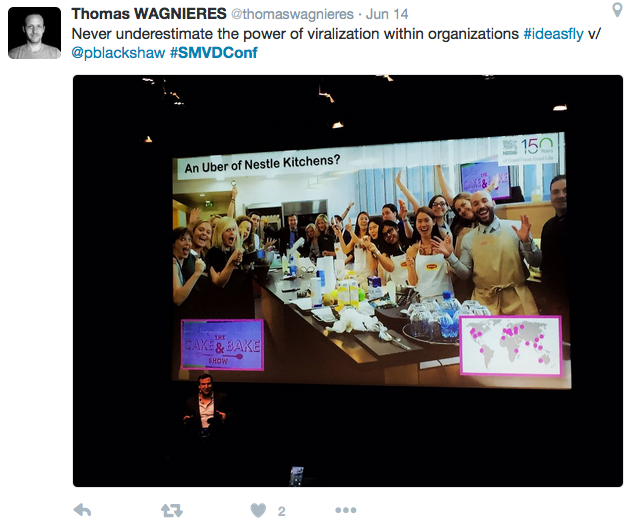 Shrink, Serve, Share, Simplify — essential in the digital world. Post-talk comments by Stephanie Booth. At some point digital just becomes part of the whole organisation. How do you use digital to make everything stronger? (including TV) General rule: advertising follows attention. Attention has leap-frogged online, so we need to follow the consumer there. Competitive threats? Pete thinks about competition very differently now — small companies rather than the big Kraft, Unilever one thinks of first. Could be partners, but also competition. Need to become really good at mapping the consumer journey. Need to de-silo. Marketing, sales, brand, e-commerce. Take a shopper-centric view across all of this. How do you get senior leadership on board? Pete finds the top often really gets it, the young people eat it for breakfast, and the barriers are usually in the middle management. Not because they don’t get it, but because the incentives aren’t there. Pete first got the management to take what seemed like a reasonable bite of the apple, and when there was success, built it out. Competitive data valuable. Memos… (they’re making news and we’re not). We’re beyond the digital tipping point, so there is a real competitive disadvantage to not have a plan/strategy released internally. Pete Blackshaw, his Twitter account. 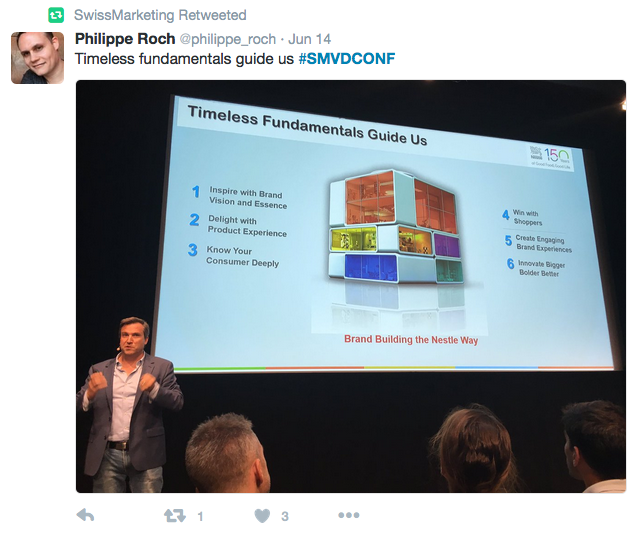 http://www.swissmarketingvaud.ch/swissmarketing/ SwissMarketing Vaud is the largest SwissMarketing section of Switzerland. 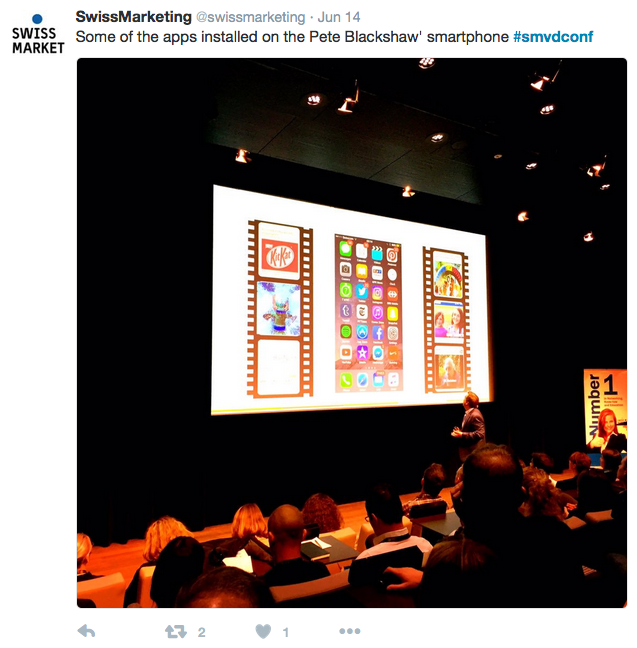 Ideal partner for companies and independent striving for excellence in the areas of marketing, SwissMarketing Vaud is always listening to the latest knowledge in the field. 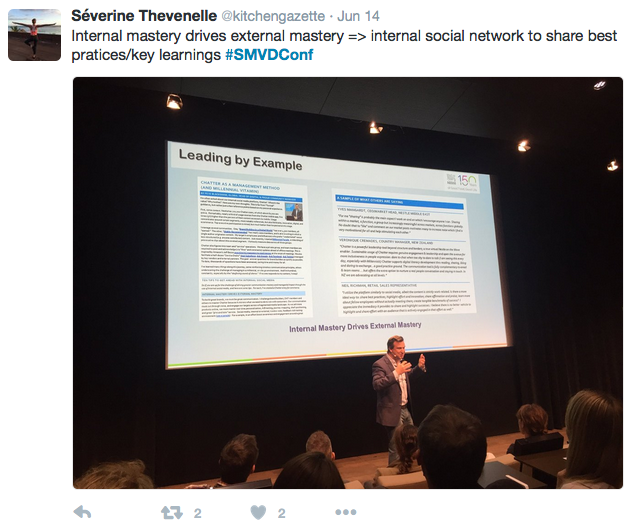 Keen to ensure the professional growth of its members, the SwissMarketing Vaud sets up conference and workshop aimed at them . SwissMarketing aims a high quality training , access to the best knowledge and the exchange of professional experiences. If you also want to strengthen your visibility on line, please contact us at +41 27 722 43 42.